On the night of January 13 and the morning of January 14, we experienced the coldest weather and nights we have seen in Solana Beach, possibly worse than the record setting 1949 freeze. The temperature at the nursery outside the shade areas dropped to between 17 and 20 degrees, depending on the location in or around the nursery. 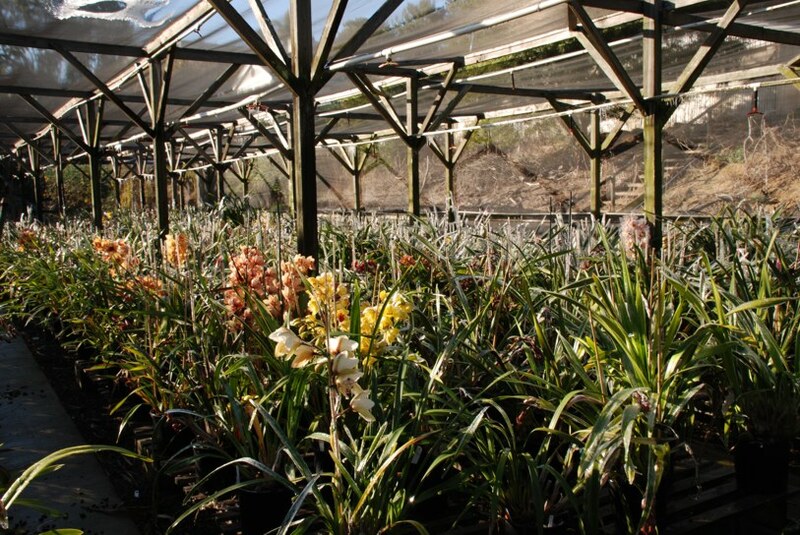 All our plants are grown outdoors under shade cloth, not in greenhouses, so temperatures this low can be very dangerous. We have a set of low volume sprinklers over the entire growing area just for frost protection, and the sprinklers are turned on when the temperature gets down to 29 degrees under the shade cloth. The temperature dropped to 29 degrees under the shade cloth in the seedling portion at about 10:30 PM, and we turned the sprinklers on at that time. It didn't get back up to freezing till about 8:30 the next morning, and there was a lot of ice built up on plants, flowers and spikes. We had to turn the sprinklers on the next three nights as well as the temperature dropped to 26 to 27 degrees. The next three nights were about 29-30 degrees as well, for a solid week of below freezing night temperatures, probably the longest cold spell in recorded history here in Southern California a half mile from the Pacific ocean. On the morning of Jan 14, the entire 20,000 square feet of the nursery was covered with ice, up to a half inch thick or more in places. There was little damage in most of the area, but there was a fair amount of damage along the sides of the shade house. Apparently, the water from the sprinklers created a chimney effect with warmer air rising in the center of the shade house and pulling in very cold air from the outside along the sides of the shade house. As a result, nearly every spike and bud along the edge was frozen, even though they were covered with ice from the sprinklers. There was little damage in most areas more than a few feet from the edge of the shade house, even with the heavy ice build up on everything. Liquid water, even when freezing into ice, stays at 32 degrees, and releases a good amount of heat in the process of freezing. 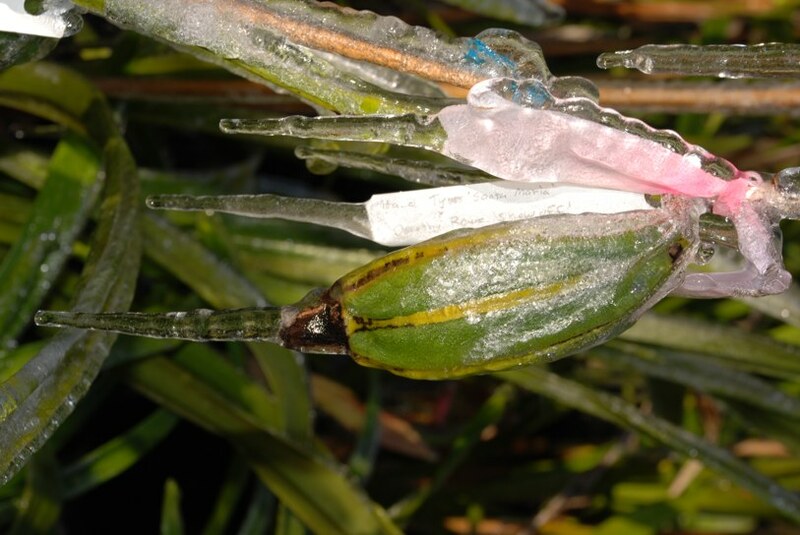 This allows the plants in ice to stay at freezing and provides some protection. 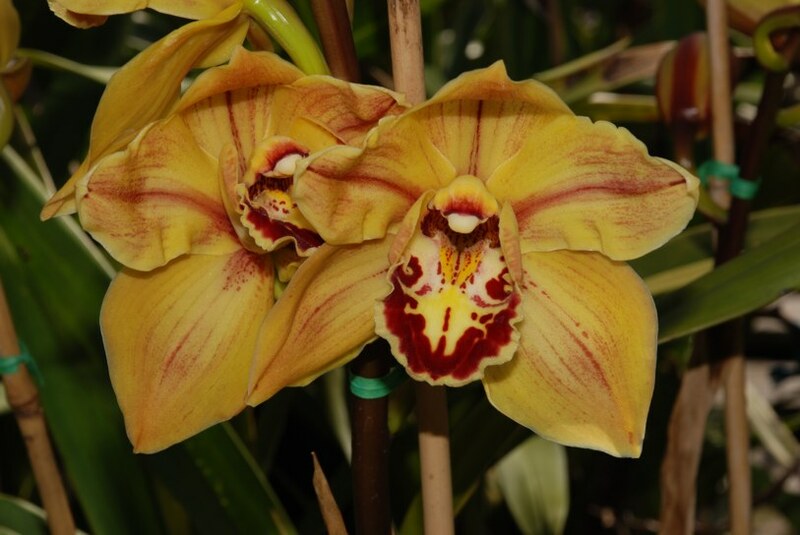 Cymbidiums, even in spike or flower, can tolerate temperatures down to about 28 degrees, so the formation of ice can provide a fair amount of protection. 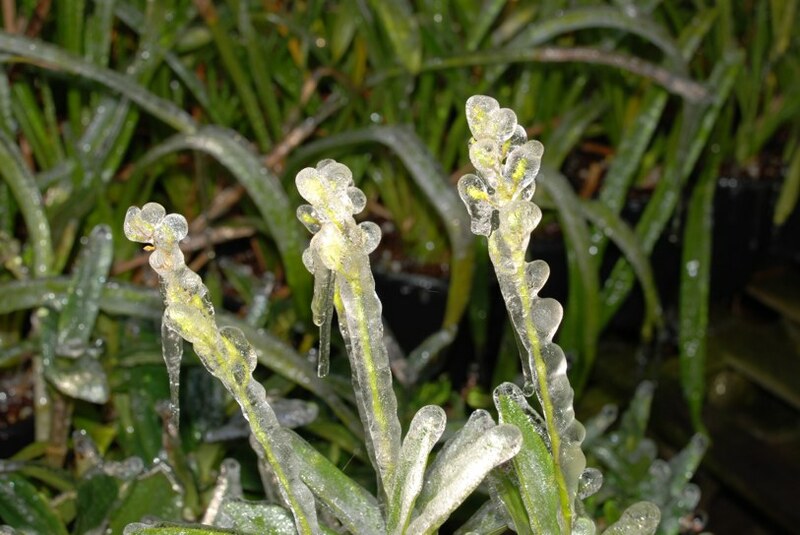 The long duration of freezing nights may result in some long term damage, but in our experience, it can take up to 6-8 weeks to show up as buds and spikes mature. At this point, we suffered damage to flowers and buds on perhaps 30% of the sales stock and possibly up to 40% of the show and breeding stock. We didn't know what the long term effects would be, but there appeared to be little damage to the plants themselves, even right at the edges of the shade house. After a year or longer had elapsed, there seemed to be little damage to most of the plants. We lost no seed pods to the ice or the cold weather. Those plants with mix that was breaking down, and were potted the next summer, seemed to have lost more roots than normal, and a few of these had severe root loss. Those with the mix still in good shape had little root loss at all, and there was no apparent long term damage. Most of the plants that had shown damaged flowers or buds, as well as those that were undamaged, generally bloomed heavily the following season, and it appeared there was no long term damage at all. 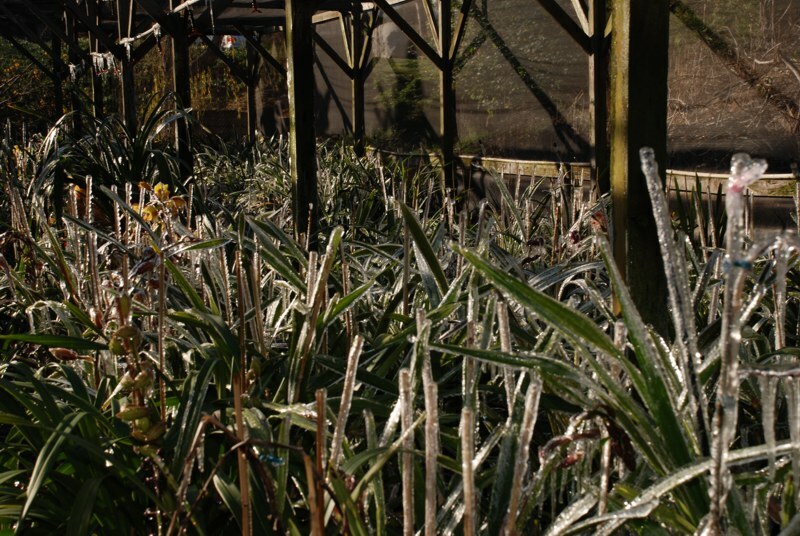 One interesting but unexpected aspect of the freeze was the sound of melting ice in the nursery after the freeze. It sounded like the proverbial bull in a china shop for about two hours as the ice melted - crash, tinkle, tinkle, crash - as the ice melted off the leaves and buds, and fell to the ground. 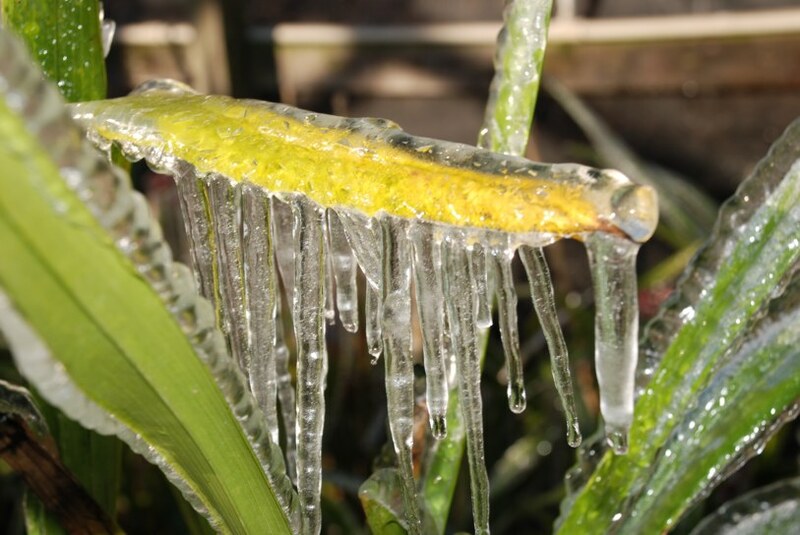 We have included a few photos of ice around the nursery to show the magnitude of the freeze. Click on the smaller images to bring up a larger image. 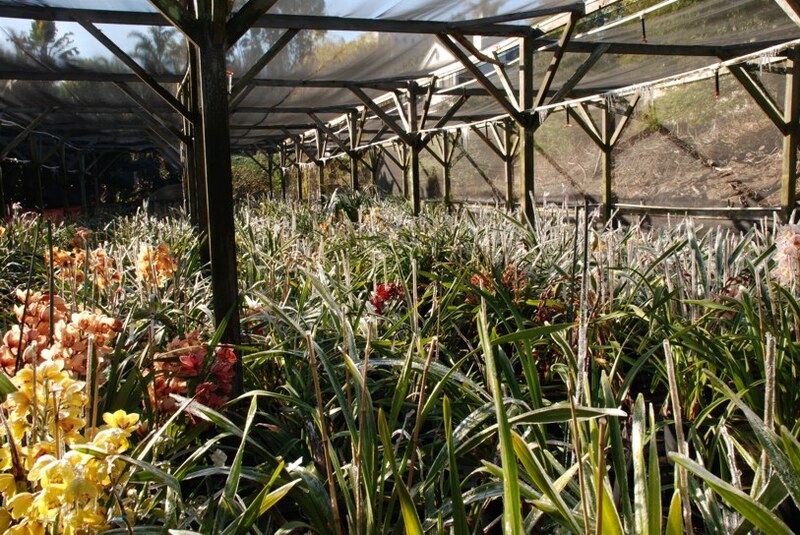 This is another view of the field of ice at the nursery. Everything was coated with ice up to half an inch thick. This is a seed pod with a three inch icicle hanging from the end. 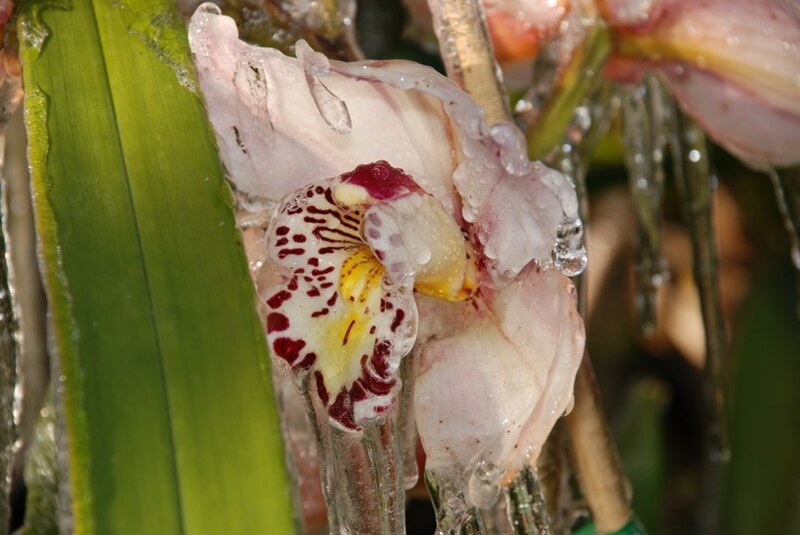 Most flowers were well covered with a thick layer of ice. This particular flower had a thick layer of ice on it and a large icicle hanging off the lip. 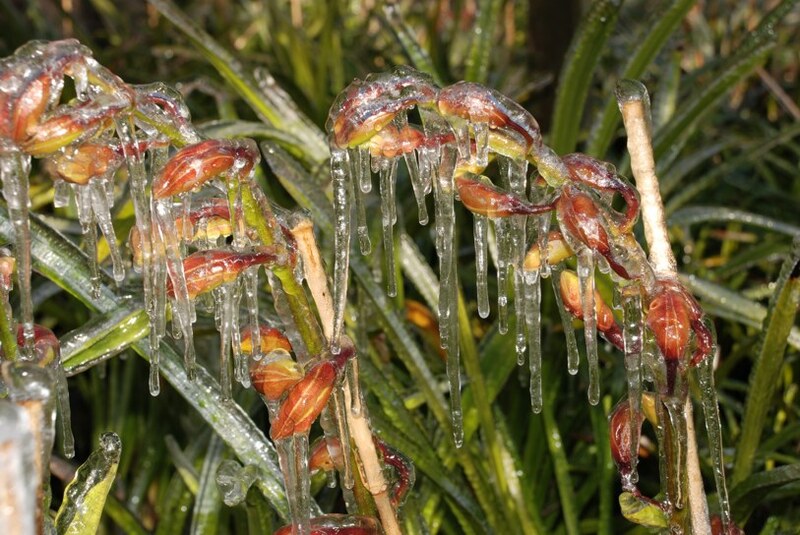 This is another plant with flowers covered with ice and icicles several inches long. This is the two flowers on the previous picture a week later. There is no apparent damage to the flowers. Some leaves had a half an inch of ice built up on them. This leaf had icicles up to six inches long hanging off the end. The ice provided its own supporting structure, and the leaves stayed in the normal position since everything was frozen together. 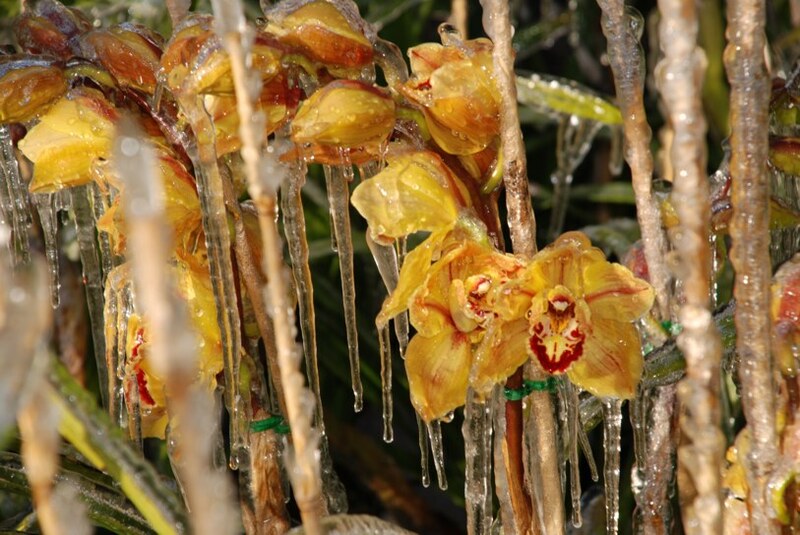 Many unopened spikes had a large buildup of ice and icicles on them and the buds. This was a common sight in the nursery. This is another spike of buds covered in ice with icicles several inches long hanging off the buds. 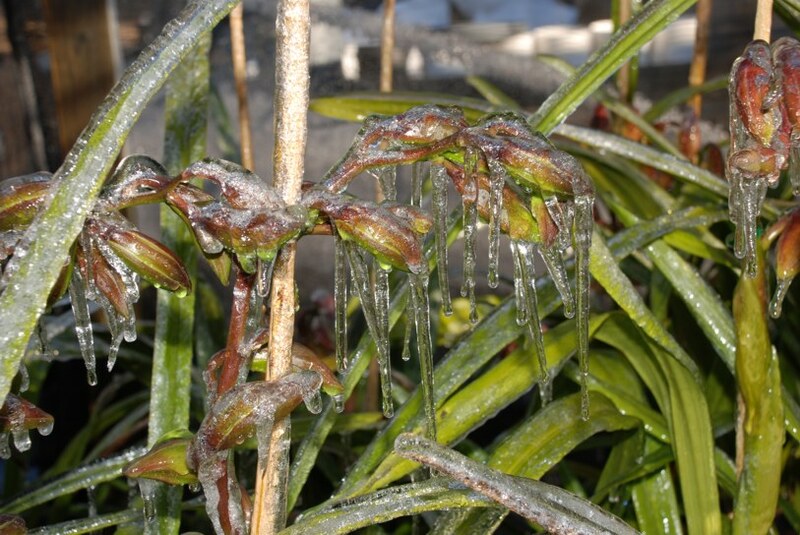 This spike of small dendrobium buds is encased in a half inch of ice. 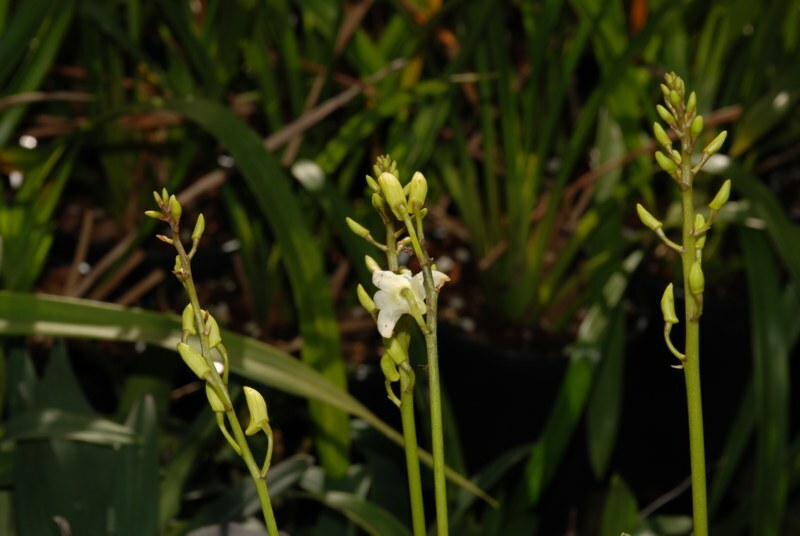 This is a photo of the spike of small dendrobium buds after a week. The first bud has started to open with only a little spotting on the back from the freeze and ice.